Several years ago, Hawthorne Village, the world-class manufacturer of holiday village collectibles, negotiated with the John Deere company for the right to mint certain collectibles that would display the quality that John Deere's products and history deserve. Customer response was huge. In fact, every single John Deere village, train, and village accessory that Hawthorne Village ever sold is now unavailable (including the one shown in the title photo - sorry). So we've broadened the scope of this page to include other brands and manufacturers, and as we come across any John Deere-themed trains, villages, and accessories, we'll post them here, too. We have even posted a John Deere-themed train set that none of our preferred vendors have, just in case you want to go looking for it yourself. Sorry for any inconvenience. This is an HO train made by a classic model train manufacturer - Athearn. A few are available through Amazon vendors as I post this, although it's not something Amazon carries themselves. This not a toy - they recommend ages eight and above, and I would recommend supervision when setting it up and learning to operate. Athern has made at least other John Deere train, with slightly different markings, so if you like this one you might want to start looking for previous models. Click the photo above to see a bigger photo and more information. Now you can own a piece of America's farming history with this first-of-a-kind Farmall HO-Scale train set exclusively from The Bradford Exchange, Hawthorne Village Division! Your built-to-last collection begins with Issue One, diesel locomotive. Soon, your collection will continue with Issue Two, coordinating engine with FREE HO-gauge track set!. Your Farmall HO-Scale train collection is then enhanced by Issue Three, flatbed train car with removable sculptural tractor, plus your FREE power pack! 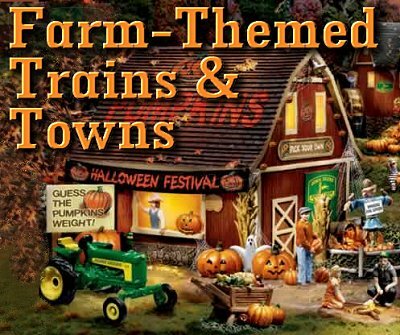 Additional coordinating Farmall train cars, each a separate issue, will follow.‡These amazing Farmall tractor collectibles are richly detailed with colorful vintage graphics, classic Farmall logos and agricultural imagery. The handcrafted collection also includes removable sculptural and hand-painted replicas of classic Farmall tractors and the cars even light up! Strong demand is expected for this exciting first-of-a-kind train collection, so order now! The American farmer and Farmall tractors - for decades this winning combination worked the land side-by-side. 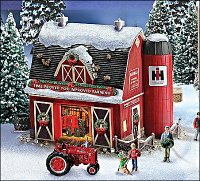 Now you can preserve a piece of agricultural history from this bygone era with this first-ever Farmall Holiday Village Collection. Each illuminated building in this collection is adorned with festive holiday decorations and "snow." Your collection begins with Issue One, Farmall Holiday Barn with FREE vintage Farmall H Tractor figurine. Soon your collection will continue with Issue Two, Farmall Country Bread Basket, Issue Three, Farmall General Store, with FREE "Gus the Farmhand" and "Mom" figurines, and additional Farmall Holiday Village buildings, each a separate issue to follow.‡This farm collectible is available only from The Bradford Exchange, Hawthorne Village Division. Each tractor and building in this collection is handcrafted and then hand-painted in classic Farmall red. It's sure to be a conversation starter with holiday guests, and will look great on a mantel, shelf or table. High demand is expected from farm and tractor collectors, so order now! Big Christmas Trains(tm) is a participant in the Amazon Services LLC Associates Program, an affiliate advertising program designed to provide a means for sites to earn advertising fees by advertising and linking to amazon.com.